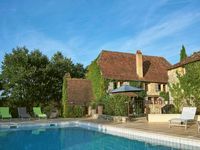 Property 1: Ideal holiday cottage in The Dordogne on edge of pretty hamlet. Private pool. Property 28: Charming Périgourdine 18 th at the edge of the Dordogne, superb river view. Property 43: Charming luxury villa with swimming pool on 4 hectares of private land, 8 pers. Very good location. Easy to get everywhere! This is better located than it might seem. It is 20 minutes from the southern edge of Sarlat ( and the rental car place and train station). Maybe 10 minutes from Domme, which we loved!! And Cenac, which has a very good market AND grocerie. Great restaurant in Daglan, La Cantina. Very good. One can drive easily most everywhere from this cottage, and you can walk quite aways into the little burg of Peyruzal ( no shops there). Fabulous view of this from Walnut, both day and night. Both Jerry and Carolyn are very personable. We loved the cottage. One caution, however. It is on two levels, the bedroom(s) and bath on the second level. The steps are fairly narrow and steep to reach it. I had no real problems, at age 72, however I was also quite slow going up. Quite enchanting countryside. We loved it.